by Susan Sterett, (ed). New Orleans: Quid Pro, 2013. 266pp. Cloth $54.99. ISBN: 978-1-61027-208-7. Paper $36.99. ISBN: 978-61027-205-6. E-book $9.99. ISBN: 978-1-61027-206-3. Reviewed by Adelaide H. Villmoare, Department of Political Science, Vassar College. E-mail: villmoare [at] vassar.edu. This volume undertakes a mission to demonstrate that socio-legal research can significantly contribute to the burgeoning field of disaster studies. In the United States 9/11, Katrina, wildfires, mudslides, and Deepwater Horizon particularly have fueled these studies, made all the more compelling globally by the 2004 Indian ocean tsunami, the 2010 Haiti earthquake, the 2011 Fukushima Daichi nuclear destruction, and an ongoing sense that climate, politics, and economic “development” will multiply and intensify disasters across the globe. Coming out of a workshop sponsored by the Onati International Institute for the Sociology of Law, this book presents a wide swath of experts’ considerations of the roles of law in creating, sustaining, ameliorating, overcoming, and preventing disasters from terrorist attacks to wildfires to earthquakes to oil spills. Cutting into this diversity of research, editor Susan Sterett observes that “Disaster is variably juridified, or governed by reference to legal rules with accountability to legal institutions” (p.3). It is this variability which characterizes the chapters that follow. As with many collections, this one includes a mix of concerns. There is little connection across the articles, except the intention of demonstrating the significance of law (imbued with many meanings) to understanding and analyzing any number of disasters. But, as Thomas A. Birkland argues in the concluding chapter, socio-legal scholars have, until recently (e.g. Sarat and Lezaun 2009, Farber et al. 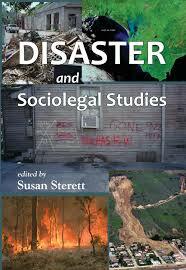 2009), been largely absent from mainstream disaster studies and are just coming fully into dialogue with this field. There is rich terrain for contributions from socio-legal scholars, of which this book is one representation. The eleven chapters and Sterett’s wide-ranging and thoughtful introduction approach law and disasters from instrumental and non-instrumental perspectives. Where Juli Ponce’s article investigates land planning policies in Spain and the EU in preventing disasters and Arthur F. McEvoy examines “situations in which legal agencies themselves contribute to conditions under which disasters (technological or natural) take place” (p.156), others interrogate epistemological premises for state and NGO understandings of responsibilities for managing disasters. Pat O’Malley’s theoretical piece, for instance, places the analysis of law and disaster within the context of “the neo-liberal dream of a society of extreme entrepreneurs” (p.23). Considerable ground is covered in these essays. O’Malley takes a wide angle, political lens to contextualize the ideology within [*350] which much Anglo-American thinking about disasters unfolds. In the face of the high uncertainty disasters present neo-liberals perceive opportunities for individuals to survive and thrive (p.33). A newly resilient person grabs hold of risk and disaster and not only makes the best of it but creates a freer self. This value informs “resilience programs” in the US and other military policies and the wider societal embrace of neo-liberal subjectivities. Urging the development of a critical, political theory of disasters, Valerio Nitrato Izzo argues that catastrophes rupture society’s normative order and “shape the sense of life on a global scene as a matter of survival, with an ambiguous legal meaning rather than as an enforceable right to life that entails a right to be protected” (p.81, italics in original). He proposes a post-colonial perspective to account for both the state and global manifestations of inequalities of risk. Disasters can serve as “legal epiphanies” fostering a critical reconsideration of understandings of inequality supported through state and global policies. Although other chapters touch on philosophical issues, they are more grounded in empirical observation. Lloyd Burton, for example, hones in on the jurisprudence of living dangerously as evidenced in two US states’ different approaches to land use regulation and risks of forest fires. Colorado’s and California’s political cultures inform divergent moral stances on land regulation relevant to wildfire prevention. Alka Sapat and Ann-Margaret Esnard look at globalism, and while not explicitly informed by post-colonial theory, their chapter on transnational/transboundary impacts of the Haiti earthquake could be seen in conversation with Izzo’s ideas. Rather than drawing directly from post-colonial theory, they deploy the sociological concept of street level bureaucracy. But they do they also keep their eyes on the ways street level bureaucrats respect displaced families as part of a diaspora entitled to humane treatment and respect for their human rights. Taking a different tack, one embedded in organizational theory, Petra Hiller contends that “The case of the regulatory program of cleaning up of contaminated land in the new federal states of Germany supports the hypothesis that different forms of risk transformation depend on an organization’s quality as a single self or a multiple self in the decision-making process” (p.191). Stability was a key factor in organizations’ actively seeking opportunities to address the contamination. As many points of view as there are represented in this book, some are largely absent : those of people most adversely affected by disasters. While the authors analyze inequalities affirmed and often intensified through disasters and policies and actions of state, trans-state, and non-state actors, the most dispossessed have little space here. Sapat and Esnard’s chapter does examine organized voices of the 2011 Haitian diaspora, but perhaps not the most marginalized. This complaint could reasonably be seen as critiquing a book for something it does not intend to do. After all the conference and these articles resulting from it are about contributions law and society scholars can make to disaster studies. But given the ways in which the law and society field has made inroads into moving beyond elite actors and perspectives to include voices of the non-elite or marginalized (e.g. Ewick and Silbey, 1998, Engel and Munger, 2003) one hopes that such voices become more fully integral to this growing literature. One final comment is a general wish about collections, especially those arising from conferences where the authors have had the opportunity to talk directly with one another. The wish is that editors and writers strive to show how their writings reflect those conference conversations. Each article has a helpful bibliography, demonstrating that the authors are in dialogue with certain bodies of literature. But the authors here are not really talking with one another. Engel, David M. and Frank W. Munger. 2003. RIGHTS OF INCLUSION. University of Chicago Press. Ewick, Patricia and Susan S. Silbey. 1998. THE COMMON PLACE OF LAW. University of Chicago Press. Farber, Daniel A., Jim Chen, Robert Verchick, and Lisa Sun. 2009. DISASTER LAW AND POLICY. Aspen Publishers (2d ed.). Sarat, Austin and Javier Lezaun (eds.). 2009. CATASTROPHE : LAW, POLITICS AND THE HUMANITARIAN IMPULSE. University of Massachusetts Press. Copyright 2014 by the Author, Adelaide H. Villmoare.